Published on July 28, 2011 in Antimimeticisomorphism, Creativity, Fun Stuff and How To Save Money. 0 Comments Tags: Beijing Egg House, Creative Architect, Dai Haifei. 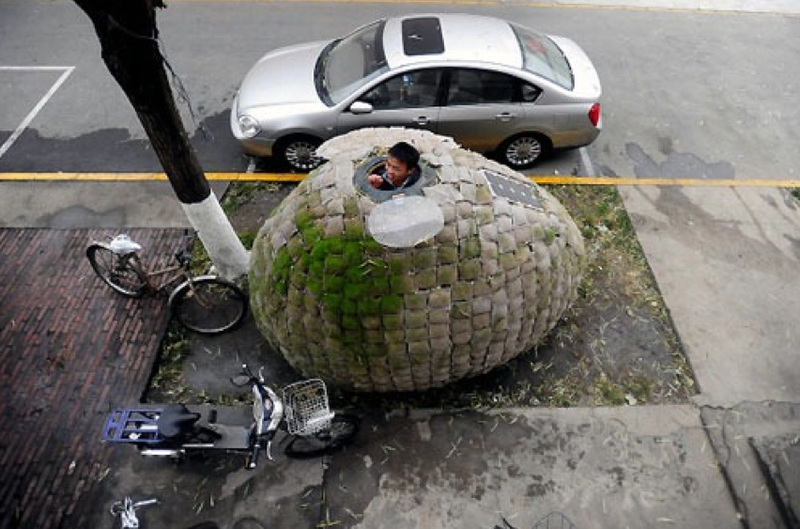 Dai Haifei, a 24-year-old architect in Beijing, China, found an ingenious solution to live rent-free. He built himself a mobile egg-shaped house that is powered by the sun. The 6-foot-high structure, which is small enough to fit on a sidewalk, is made of bamboo strips, wood chippings, sack bags, and grass seed that’s expected to grow in the spring. The pod features a solar panel on the roof that powers a lamp in the cozy space. The house cost around $1,000 to build (6427 yen), according to China Daily. It seems Haifei has taken the trend of living in tiny spaces to a whole new level and is definitely another case study example of antimimeticisomorphism in action! Published on November 25, 2010 in Creativity and How To Save Money. 0 Comments Tags: Frugal, Save Money, Simplicity, Voluntary Simplicity. Can you really buy absolutely nothing for just one day? You might say “Sure!” but can you ACTUALLY go one whole day without transacting ANY business? Are you totally debt free so that you can go a whole day without accruing interest on your mortgage? Are you off the grid so that you can go a whole day without paying the power company? Do you have ANY utilities? Water, Sewer etc? Do you have a cell phone? Do you have stocks or other investments that transact business in your name every day without your input? Do you have other debts, such as credit cards that accrue interest? Can you really go one whole day without buying anything? Try it! Of course, we say this not to push you to attempt the impossible or go to extremes. We just want everyone to think about how integrated these transactions are into our daily routines. Definitely something worth thinking about! This is a concept based on the Voluntary Simplicity movement – it’s something I teach my elite Platinum Members. Without going overboard, it helps you focus on what’s most important in life so that you get more enjoyment, fulfillment and satisfaction with less stress, pressure and frustration. Published on April 19, 2010 in Antimimeticisomorphism, How To Save Money, Motivation and Positive Thinking. 0 Comments Tags: Coinstar, loose coins, money saving tip, Save Money, saving, spare change. Have you ever collected spare change in a jar or piggy bank? Well guess what? There’s a high tech way to do it now. Many banks and credit unions will top up your purchases on your credit card to a selected savings account – automatically. If you buy something for $10.73, the 27 cents are rounded up and placed in your savings account. If you spend $19.95, then five cents are saved and if the total is $20,11, 89 cents are put aside for that rainy day. Not all banks and credit unions offer this, but I am sure you could find one that can. The benefit of doing this is the same as putting spare change in a jar, with the added benefit of compounding the interest for you automatically. Don’t think it’s worth it? Think again. Coinstar estimates there is $10.5 Billion in loose change in US households right now. That’s BILLION, not MILLION. I bet if you scrounge around, you’ll find a few dollars of your own! Add to that foreign currencies and well, you get the picture. As I’ve said countless times, it’s all about applying the 1 Percent Improvement Doctrine, doing the little things SYSTEMATICALLY that end up making a BIG difference.